LEXIE CANNES STATE OF TRANS — UPDATE-2 March 16, 2015 — An arrest has been made in the murder of Gizzy Fowler. See below. UPDATE March 11, 2015 — An arrest has been made in the murder of Deshawnda Sanchez. See below. 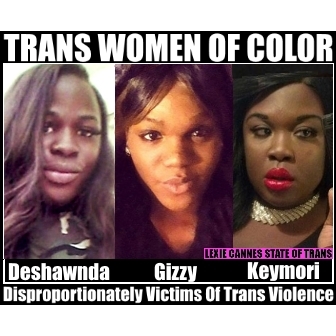 Original article: In addition, trans women of color continue to be disproportionately victims of transgender violence. It is society’s burden to understand that racial prejudice impacts trans women of color the more than any other marginalized group of people in our society. Until we reverse conditions for trans women of color, trans murders are likely to continue at the rate they are occurring now. A few days prior to TDOR 2014 in November, Gizzy Fowler was gunned down in front of a home in Nashville, Tennessee. Neighbors called police after hearing gunshots, and police found Fowler on the ground near her car. Reports say the house was unoccupied. There has been no further updates since this initial report. A man identified as a suspect in the murder of 24-year-old black trans woman Gizzy Fowler, who was found fatally shot next to her car in November, turned himself into police Tuesday, reports Nashville news station WSMV. Mallory Antoine Porter, 18, surrendered himself to authorities the same afternoon that local media announced he had been identified as Fowler’s murderer, but he has denied being involved in the crime. An arrest warrant was issued for Porter after Fowler’s phone records revealed she had traveled to the area where her body was found to meet someone. Forensic evidence revealed that unnamed individual to be Porter, according to WSMV. In early December, Deshawnda Sanchez (aka Tata) was shot to death in the Compton area of Los Angeles. Police say she was pounding on the door of a house seeking help while being shot. A neighbor’s surveillance camera captured some of the incident. Police believe robbery was involved. At this writing there is no further news. “Police have arrested a self-described former gang member suspected of killing a transgender woman who was shot to death in Los Angeles as she pounded on the front door of a house seeking help, investigators said on Thursday. The December killing of 21-year-old Deshawnda Sanchez raised concerns among transgender rights activists that she may have been targeted because of her gender identity, and Los Angeles police supervising detective Chris Barling said her transgender status may have been a factor in the slaying. Also in early December, Keymori Shatoya Johnson was shot to death in her Albany, Georgia (USA) home. Police arrested Kuyaunnis James that same day and supposedly charged him with manslaughter. Police did not reveal any further details. Johnson’s mother told news reporters Keymori was shot at twice while trying to get away. A grand jury was supposed to have been held on Dec. 18th, however I’ve been unable to find a updated news report on what transpired that day, that is, if it was held at all. In mid-November, Gay Star News reported the death of a trans woman in the former Soviet state of Georgia. The unnamed victim was found dead in a burned out locked apartment in the capital city of Tblisi. It is believed the fire was started to cover evidence of the murder. No further information available. It’s been a while since I had the chance to sit down and read one of your entries; it was a busy month. I was remembering the first time that I heard the word “transgender”, I was eight, and it was back in my birth country Colombia, specifically in my birth city Cartagena. I grew up in a city where collectivism was the rule of the land, and if you there to be different or be yourself, you could face repercussions. I heard for the first time about LGBTQ with the documentary of Jenny Livingston “Paris is Burning” and suddenly I didn’t felt alone but also the film it opened my eyes to a reality that was beyond my street, the reality of discrimination of the LGBTQ and the Trans-erasure because it was the first time with Venus Xtravaganza that I saw the repercussions of intolerance and bigotry. Two decades I would experience within my own flesh, the first by the murder of a teacher and how the city police didn’t reacted and later by the shunning of my own parents, telling me they hope I died from AIDS and that I return crawling. I never looked back, but I can relate to the late young Leehlah Alcorn, because that was exactly the same environment I grew up in, and I felt because of them that I was worthless, if I wasn’t the way they wanted. I am happy I have a partner who is soon to be my husband, a friend that is like my sister and a circle of friends that prevented the worst. My only wish and I know as a collective we can do it, is gather harmony and respect as members of the human race, because we all are equal with our own individual personalities and self. Thanks for commenting Gus, May I ask what country you’re living in now? Again, while the violence in general in our community, murder in particular, is abhorrent, this needs to be addressed on a societal level. Understand that while the violent proclivities of American general are in need of adjustment, it appears that violence in the communities of color is at disproportionately high levels of occurrence. Whatever the cause, poverty, oppression, morality, tradition, there are issues in the black society that need to be resolved. easily see more African-American sisters would be murdered. Hannah, it is terrible. But remember: there are countries in which our rights are protected, where we are part of the communities, and many of us are valued for our talents. These countries are primarily in the European Union, although some Buddhist countries are also friendly to us (Buddhism is not a religion but a life philosophy based on love, acceptance, and giving to others) . . . it’s not hopeless at all. never give up hope. It’s slower here in the USA but it will end, I know it.